Nordic leaders are rallying for a greener fashion industry with the launch of a first-of-its-kind scheme to position Sweden, Norway, Denmark, Iceland, and Finland as leaders in sustainable design, production, and consumption. Unveiled by the Nordic Ministers for the Environment in Copenhagen on Monday, the action plan seeks to create a "circular economy" for garments and textiles no later than 2050. "Sustainability must not be an accessory," said Kirsten Brosbøl, Denmark's minister of the environment, in her opening remarks. "It has to be straight to the core, and it should be in every fiber." Quoting the European Union EcoDesign Directive, which states that 80 percent of a product’s environmental impact stems from choices made during the design phase, Brosbøl said that the Nordic design industry has the opportunity to minimize the footprint of its textiles, even when they’re being produced halfway across the world. Doing so requires not only rethinking the way they design textiles, but also they we produce, market, care for, and circulate them, Brosbøl said. She described the plan’s four-prong approach: first, fostering sustainable designers through joint education programs across the Nordic region. Second, mitigating environmental pollution through a common supply-chain standard, while pressuring the EU to enhance chemical regulations. Third, cultivating a bigger market for sustainable fashion through green procurement and eco-labels. And finally, shfiting the market toward greater recycling and reuse. The Copenhagen event also featured presentations from companies such as Atlantic Leather, H&M, Pure Waste, and With & Wessel, as well as a “Nordic bazaar” of ethically minded brands in the region. The textile industry is one of the most resource-consuming sectors in the world, Brosbøl said, noting that a Nordic citizen's annual consumption of textiles uses more water than a family of three over the course of a year. "What we do with fashion and textiles matters beyond how we look," she said. "We cannot be well-dressed at the expense of our environment." Quoting the European Union EcoDesign Directive, which states that 80 percent of a product's environmental impact stems from choices made during the design phase, Brosbøl said that the Nordic design industry has the opportunity to minimize the footprint of its textiles, even when they're being produced halfway across the world. She described the plan's four-prong approach: first, fostering sustainable designers through joint education programs across the Nordic region. Second, mitigating environmental pollution through a common supply-chain standard, while pressuring the EU to enhance chemical regulations. Third, cultivating a bigger market for sustainable fashion through green procurement and eco-labels. And finally, shfiting the market toward greater recycling and reuse. "This is not going to be a quick change, it is a complete makeover—it is for the long haul," Brosbøl said. "And we cannot do it alone. That is why we invite industry, civil society, and political actors across the Nordic region to come together, to work together and to change together." 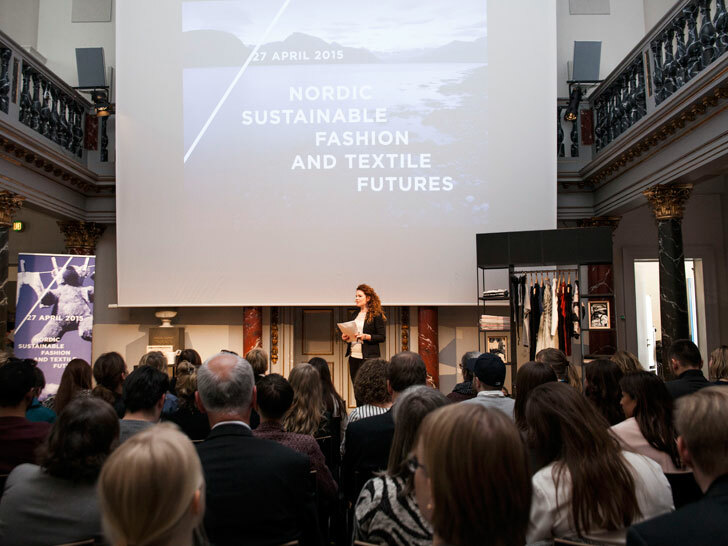 The Copenhagen event also featured presentations from companies such as Atlantic Leather, H&M, Pure Waste, and With & Wessel, as well as a "Nordic bazaar" of ethically minded brands in the region.